Inspired by a client’s needs and driven by good old-fashioned American ingenuity, window treatment professional Carla Ingram has made comfortable outdoor living beautifully possible with her patented Weather Queen Shades. Founded in the north woods of Wisconsin, where lakes abound and screened porches function as multi-season living rooms, the company originally developed the shades for a client who wanted to protect the furniture, accessories, and flooring on her screened porch. She was looking for outside-mounted coverings that could be operated from the inside. Designing a Roman-style shade that fulfilled her client’s wishes, Ingram struck gold. For the past 13 years, she has focused her energy on perfecting porch living. Nowhere are porches more appreciated than in the Lowcountry, where Weather Queen Shades is now helping to protect them from the dirt and weather events that can keep homeowners from enjoying their outdoor spaces. Construction of the shades includes a brilliant track and pulley system along with 80 color choices of Sunbrella® awning fabric. Designed with no more than an eighth of an inch between the lowered shades and the home, fresh air flow is maintained while minimizing dust and weather intrusion. American made and manufactured, Weather Queen Shades have been installed on porches throughout Wisconsin, Minnesota, Virginia, and now the Lowcountry, where Ingram’s brother, Greg Erwin, Savannah resident and engineering consultant on the development of the shades, represents the company. Erwin and Weather Queen Shades recently joined the Hilton Head Area Home Builder’s Association. “We are finding that working with builders is very successful. 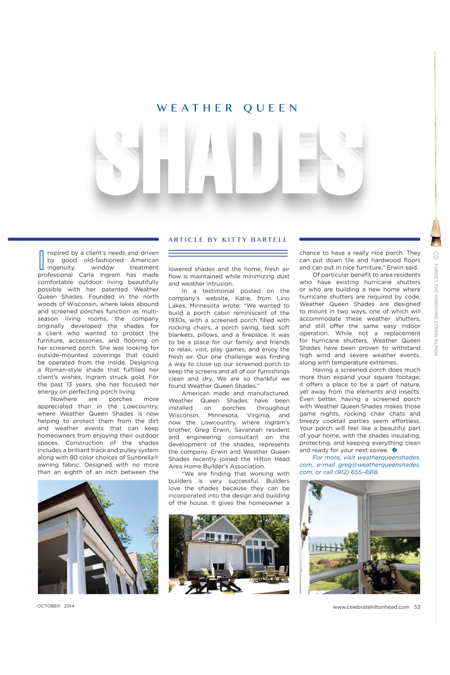 Builders love the shades because they can be incorporated into the design and building of the house. It gives the homeowner a chance to have a really nice porch. They can put down tile and hardwood floors and can put in nice furniture,” Erwin said. Of particular benefit to area residents who have existing hurricane shutters or who are building a new home where hurricane shutters are required by code, Weather Queen Shades are designed to mount in two ways, one of which will accommodate these weather shutters, and still offer the same easy indoor operation. While not a replacement for hurricane shutters, Weather Queen Shades have been proven to withstand high wind and severe weather events, along with temperature extremes. For more, visit weatherqueenshades.com, e-mail greg@weatherqueenshades.com, or call (912) 655-4918.